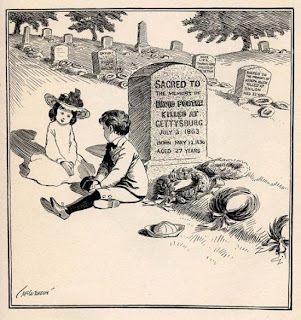 Obituaries can be great resources for filling in both recent and past generations of branches of your family tree, but one has to be very careful about the assumptions one makes when reading them. I was unable to assign the other grandchildren to their parents without further information. I suspect there are a number of genealogists who would fill in the blanks as I did, carefully noting where they got the information, naturally. ...Mrs. Schwinn…She is survived by her father, Ethan Johnson; mother, Robin Schwinn; sister, Penny Molloy; brother, John Johnson; grandmother, Opal Johnson; and close friend, Patricia Marie. I knew something was wrong somewhere. There was no way Alice's father was her sister’s husband. 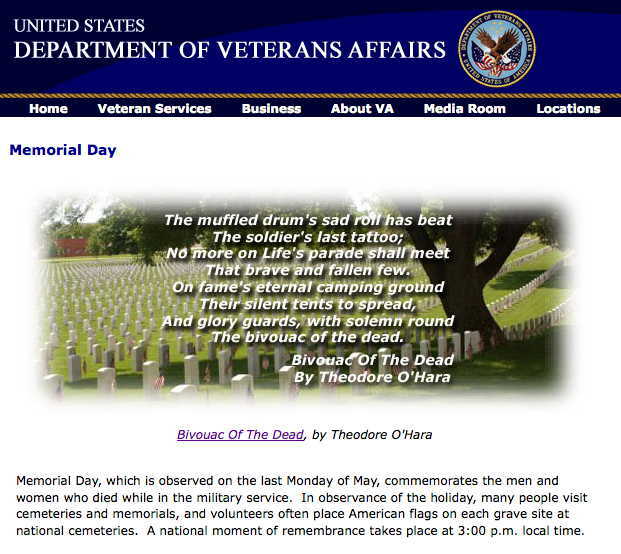 And here was a brother not mentioned in the first obituary. After a little thought I redrew the tree. This information fits both obituaries, but contains some new assumptions. In order to confirm these, I could make a trip to the library and look up some marriage records in the microfilm. Or I could try to contact the cousins. It is common for individuals to be better known by their middle name than their first, especially when they share a name with a parent. It is also common for half-siblings and step parents to be referenced without the modifiers. This leads to ambiguity that sometimes doesn't appear ambiguous. I began this project back on February 16, 2009. (Recently the posts have been sporadic, but for a few years it was weekly.) Since I began, many others have joined in on the meme. I am thrilled that this meme I started has inspired so many to transcribe and share their family history documents. Why do we transcribe? I provide my three reasons in the linked post. You may find others. I've written in the past that in the role of Family Historian "I’m careful not to infer what someone’s thoughts or beliefs were, unless they were written down. I record the facts as they are known." While the reasons that the southern states seceded in the Civil War are well recorded with each state's Declaration of Secession, the reasons individuals chose to take up arms are not. The reasons individuals join the armed services today differ greatly, and I imagine the reasons differed 150 years ago, as well. So I refuse to sit in judgment of the decisions of my ancestors without knowing their reasons. Two years ago, I discovered some records at Fold3 concerning my wife's 3rd great grandfather, Lewis C Gober. It appeared that he spent some time in the St. Louis Gratiot Street Prison as a prisoner of war after voluntarily giving himself up. 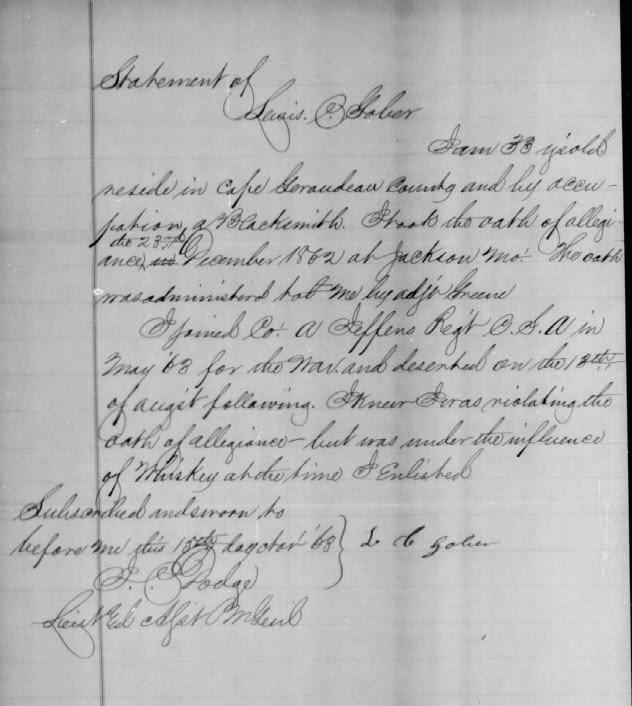 The records indicated he surrendered himself on Aug 28, 1863, was charged with violating his oath of allegiance, was tried by court martial, and was released on Feb 29, 1864. There was no other information, so I had no clue why he violated his oath and joined the Confederate army. I also had no clue why he decided to surrender himself. In the past 2 years, Fold3's Civil War records have grown. I conducted a search recently, and found some more relevant records. I found the actual signed Oath of Allegiance, dated December 23, 1862, as well as the official declaration of charges against him, and his signed statement explaining his actions. I am 33 years old reside in Cape Girardeau County and by occupation a Blacksmith. I took the oath of allegiance the 23th December 1862 at Jackson Mo. The oath was administered to me by Adjutant Greene. I joined Co. A Jeffers Reg’t C.S.A. in May ’63 for the war and deserted on the 18th of August following. I knew I was violating the oath of allegiance but was under the influence of whiskey at the time I enlisted. This is a reason for taking up arms I hadn't previously considered, and is a good example of why one shouldn't make any assumptions about an ancestor's thought processes without seeing an explanation in their own words. Hartley is a locational surname derived from the Old English 'Heort' (Hart) and 'Leah' (Wood or clearing). George W. Hartley is my 3rd great grandfather. His descendants testified in front of The Dawes Commission that he and his wife were part Native American. Most of their descendants remained in Texas. International Workers' Day [aka Labo(u)r Day] which has its origins in Chicago's Haymarket Affair. [Chicago Historical Society's Haymarket Affair Digital Collection]. Ironically, while the International Workers movement chose May 1 to honor the Haymarket Affair, Labor Day is observed in September in both the U.S. and Canada.